For your convenience we offer the following payment options; American Express / Visa / MasterCard / and cash. We do not accept cheques without prior arrangement. 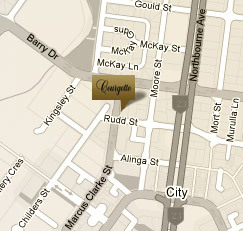 Courgette Restaurant is located at 54 Marcus Clarke Street in Canberra City.